There wasn’t a dry eye in sight when a company founder gave his employees the surprise of a lifetime this week. 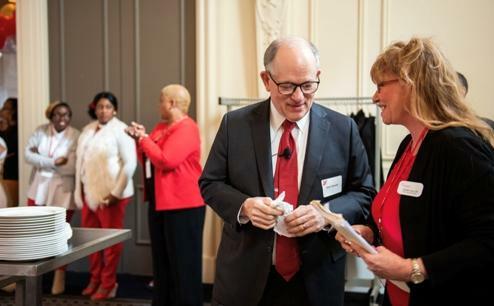 Mark Baiada, the chairman and founder of Bayada Home Health Care, a $1.4 billion private housing company in Philadelphia, announced his grand surprise over a holiday luncheon at the Belleve Hotel in Philadelphia earlier this week. The money was given to the staff of 32,000 who received varying sums based on their length of employment. Long-time staffers were given tens of thousands of dollars and new hires received $50. Even retirees who left the company after 2010 received sums, Baiada reported to Yahoo Lifestyle. Some employees already have plans for their munificence. Nicole Green, a pediatric nurse who works with clients such as those with cerebral palsy and premature babies only worked at Bayada for three years and will use her funds toward her daughter’s college tuition.